After reading David Allen’s Getting Things Done: The Art of Stress-Free Productivity a few years back (great book! ), I was inspired to change the way I managed my to-do list. For quite a while, I had been maintaining my lists of tasks, projects, and ideas in a discombobulated mess of sticky notes, whiteboards, todo.txt’s, Outlook tasks, and random files on my hard drive. I took some of the ideas from GTD and applied them in a way that worked for me. I settled on two technologies: a wiki (for notes, lists etc), and todoist.com for task management. There are several good web sites and programs out there that aim to let you apply Allen’s GTD principals, such as Remember The Milk (RTM), Todoist, Toodledo, Outlook, Google Tasks, and even maintaining a todo.txt. One of my favorite blogs is Lifehacker, which is focused on GTD stuff, and has covered todoist.com and RTM as well as similar sites. They’ve published a book called Lifehacker: 88 Tech Tricks to Turbocharge Your Day and a sequel Upgrade Your Life: The Lifehacker Guide to Working Smarter, Faster, Better , that are both fun reads. There’s been a lot of activity around GTD since the book was published, and many websites and apps attempt to provide a seamless way for people to manage their life in a GTD way. You can nest tasks and projects, prioritize, tag, colorize, and set absolute and recurring due dates. The interface is dead-simple and very quick. In the three years that I’ve been using the site, there’s only been a few moments of downtime. It manages hundreds of my tasks (all prioritized!) with ease. I honestly think I worry less these days, knowing that all of my tasks and projects are neatly organized. Yes, I am often slightly OCD. However, I had a big concern that Todoist, which now stores 100% of my tasks, may disappeared without a trace some day. 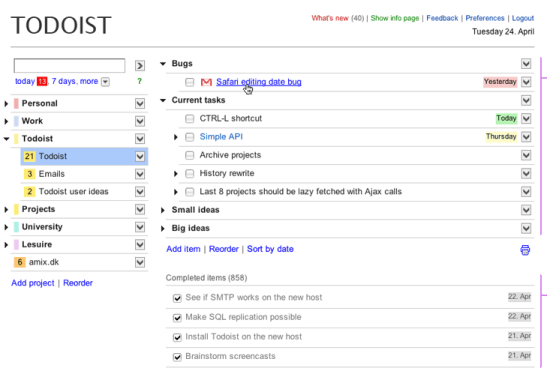 Luckily, Todoist provides a simple JSON API for retrieving all of your projects and tasks. With this API, I was able to build a simple C# app (TodoistBackup.exe) that does daily backups of my Todoist data, just in case Todoist were to ever disappear unexpectedly. (What to do with the data is another question entirely, but I’m sure I could deal with a text file until I found the time to write a replacement… 🙂 ). /// Initializes a new instance of the TodoistProject class. The program and source code for TodoistBackup is available on Github. If you have any suggestions, find bugs, or want to contribute, please head there. Thanks for creating this. I love the idea. However, I am having a hard time figuring out how to use the program. Can you offer any advice? Sorry to be such a noob. Ah yes. I figured it out. Thank you very much. Like you said, I’m not sure what I would do with this data if Todoist ever disappeared. But it is definitely reassuring to know that I now at least have the text file of all my tasks. Unfortunately, though, I am even more computer inept than the above poster. I have been trying to figure out how to make this run as a daily task, with the arguments and all, but everything I’ve tried has failed. If you get a chance, could you give me a super-basic run through of how to do such a thing? (I’ve been searching google and trying various solutions, but I’m messing it up somewhere). Are you using Windows XP or Vista? The two arguments are your API token (from Preferences | Account screen in todoist.com), and the output file name. Nice! Looks like a good class library to base future projects off of.